The 29th November we gave to Esther Escolano Jover the ‘Bateig’ award for the prescription of Bateig natural stone she made in the office building of the Industrial Complex ‘Martínez y Cantó’ S.L, located at the Spot Cucuch, 22 Novelda, whose promoter was Mr. José Cantó Carbonell. The project had the Management of Esther Escolano Jover as architect, and Ramón Pérez García, as technical architect. Moreover, as contributor, the project had the technical architect Miguel Ángel López Guillamón. 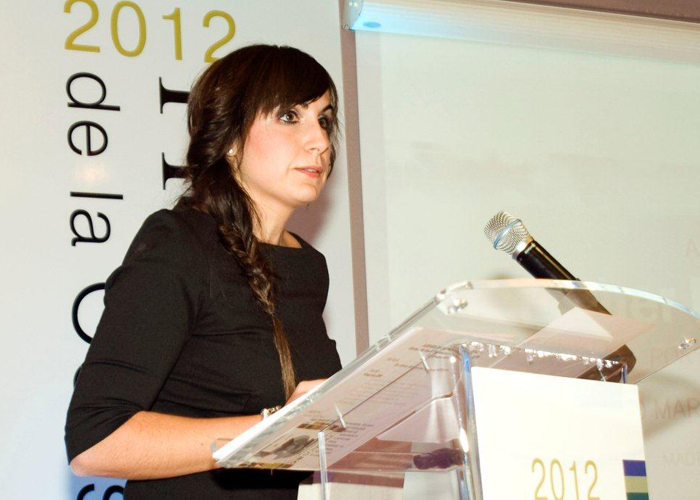 Esther Escolano Jover, Architect-Town planner graduate of the Higher Polytechnic School of Alicante in 2008 and Official Master in Urban Planning at the High Technical School of Architecture of Madrid, started her collaboration in 2004 with Ramón Pérez Garcia, Technical Architect, in his Architecture Office. In 2008 they created a Studio of Architecture and Urban design, whose practice is focused on the total development of architectural projects. This team of professionals has been growing in proportion to the developed activity. – You have just received the ‘Bateig’ award for your prescription of Bateig natural stone in the office building of the Industrial Complex ‘Martínez y Cantó’ of Novelda, which was the reason to choose Bateig natural stone in the realisation of this project? In this case, thanks to the close collaboration and implication when promoting the project, a company from my hometown, Novelda, dedicated to automatic packing of infusions, which is clearly a family business since the time it was founded at the beginning of 1970 by Francisco Martínez y José Cantó. Both meetings were held until the formalization of the project with our customer, Mr. José Cantó. We analysed together the needs program of his company, problems were posed to the full extent, and all the real possibilities about the construction of the project were studied. Materials and details were essential to the project definition; thanks to them it was possible to design an office complex that reflects the values of a company with more than 40 years of experience and, at the same time, a building very representative in modern architecture. Natural stone with steel and glass were used as creative tools for our purpose, and natural stone had a special importance in our work for the strong representative character it has in our local cultural history and in our typical Mediterranean architecture. -Which qualities of Bateig natural stone would you highlight? In the studio we like to design thinking about noble and quality materials. The main features of Natural Stone are its resistance to various types of stress and especially its appearance. This stone is very easy to work and carving. The plasticity of the stone when creating facades with different reliefs, cuts and colour varieties gives us a lot of scope and gives the work the purity and elegance of stone. – You as an architect have a relatively young career. How did they face your first steps? I could not have started my professional activity without the help and support of the professional experience of Ramón Pérez García, Technical Architect of the winning work; together we have built a team of professionals that has been growing in proportion to the developed activity. We have a ‘vocational’ feeling when we are in front of a new professional challenge; we enjoy the whole process, from the creative part to the realization of the work. Currently the everyday in this profession is very hard, projects are few in number, but we try to give the best of ourselves as professionals and technicians every single day, and cover a wider range of specialities within the field of architecture. – The crisis is really affecting the construction sector. How are you dealing with the problem? Is internationalization through collaborations in Dubai helping you? Which advices would you give to young architects who cannot find opportunities? As I said before the architecture field offers a very wide range of specialties, until a few years ago many of us have had a career marked by the architecture purpose, but architects have many tools in their hands, more than the ones given by the degree. The economic situation forces us to look, to innovate, and to undertake, I believe that our training is joint to certain intrinsic qualities such as perseverance, adaptation to new working environments, creativity and entrepreneurship that we must fully exploit. In our case it is true that we are looking for the internationalization through the specialization and the design of ventilated natural stone facades. We have collaborated in the design of various proposals of buildings in the United Arab Emirates. Lastly, I would advice the new architects who are finishing in the schools that they must keep their ‘vocational’ feeling about the profession, their creativity and all the skills they have, and they should use all together as a tool to adapt to the current situation.